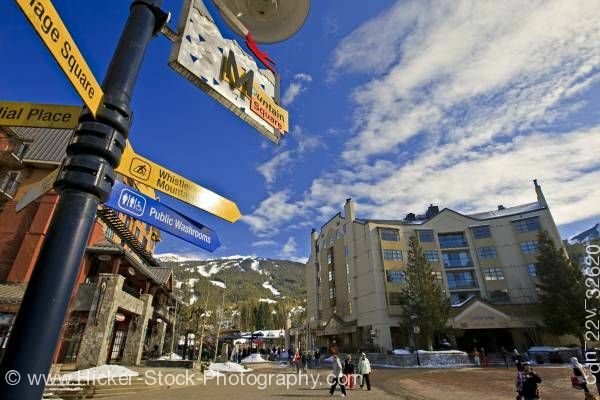 Stock photo of Mountain Square along the Village Stroll with Blackcomb Mountain and blue sky in the background, Whistler Village, British Columbia, Canada. Mountain Square along the Village Stroll with Blackcomb Mountain in the background, Whistler Village, British Columbia, Canada. Irresistible aromas frequently waft from creative kitchens as one wanders the quaint village walkways. From a mile high, there are countless manicured ski runs that wrap the mountain contours like white woolen scarves, eventually funneling down to the glistening village. Hugging up to the village’s pristine perimeters are fabulous five star hotels. As well as retail outlets, there are opportunities for adventure tours here as well. There is also dog sledding, heli-skiing, flight-seeing tours and more.